Great Bear Rainforest – The Great Canadian Travel Co.
Also called the Inside Passage, the Great Bear Rainforest is a land of fjords, rainforests and great river estuaries. Here, you can view grizzly bears, the mysterious white Spirit Bear, whales and, if you’re lucky, wolves. Book early – these sell out quickly! As availability changes frequently please check with us for current available cruises. Plus CA$100 Sustainability Fee, per person on all sailings and all cabin types. Prices are shown in CA$ and are per person. There is no single supplement on SV Maple Leaf cruises. On the MV Swell and the Cascadia single use cabins are available at 1.5X the per person twin-share rate. Board the Maple Leaf, MV Swell or Cascadia (catamaran) in Bella Bella, BC, and embark on your Great Bear Rainforest tour, orientation, cruising. Island anchorage, river exploration, and learning about the ‘salmon forest’. The trip begins and ends in Bella Bella, BC. We can arrange your flights for you once your cruise has been booked or provide you with the flight dates and times required in order for you to book your own airfare. There are no roads in the Great Bear Rainforest – instead all travel is by water. 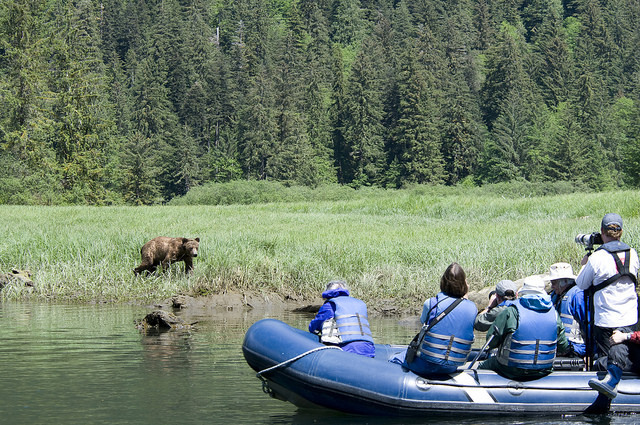 Robert F. Kennedy, Jr. calls the area “the last stand of the great North American rainforest.” Explore British Columbia’s Great Bear Rainforest by luxurious yacht with just a few guests, guided by the expert local crew, naturalists and guides of Maple Leaf Adventures. 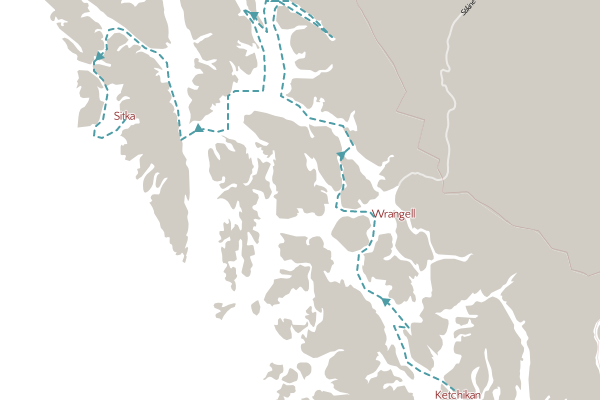 This trip includes moderate walking, bear viewing (from zodiacs, on land and in some cases at a bear viewing stand), zodiac rides, other wildlife viewing (whales, marine mammals), natural history, culture, sailing, village visits, hot-springs (often), kayaking and even fishing! Great Bear Rainforest – Fjords that Harbour Wildlife! At the Pacific ocean’s eastern edge, the sea breaks against BC’s western islands and sandy beaches. Then it snakes down glacier-hewn valleys at the foot of the mountains: these are the Great Bear Rainforest’s fjords. Some call it “Yosemite by the sea”. On SV Maple Leaf and MV Swell you’ll travel close to the fjords’ granite walls, where waterfalls drop hundreds of feet to the ocean. Whales and dolphins may surface and feed beside us while we travel! The ancient rainforest of spruce and cedar trees clings to some mountainsides and pushes out of the fertile river valleys. You’ll walk here with the naturalist and see why people have described these forests of ethereal green light as “living cathedrals”. In the eighteenth century the European explorers had another word: sublime. Where the rivers and forests meet the sea, the Great Bear’s fecund estuaries form. These meadows and brackish waters are of prime importance to the area’s wildlife, from bears and wolves to eagles, ravens and ducks, providing food in spring and fall and transitioning fish and nutrients between forest and sea. The rich river estuaries in the spring and the prolific salmon runs in the autumn support B.C.’s largest remaining populations of the mighty grizzly bear. 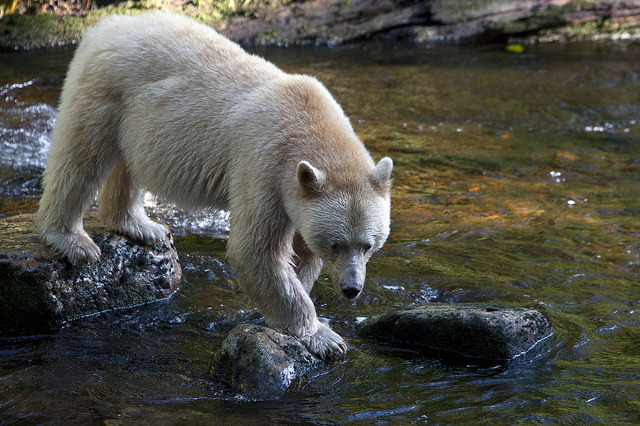 The area is home to an equally large population of black bears and is the habitat of the rare, white Spirit bear (or kermode bear). With Maple Leaf, you’ll float in a shore boat or sit in a safe place on land to watch these great mammals fish, rear cubs, munch on sedge or turn over rocks for crabs and other marine snacks. You’ll also learn the “behind the scenes” information about how the estuaries work and support the life of the Great Bear Rainforest. In the Autumn, spawning channels of the rivers are covered with salmon. This spectacle creates a feeding frenzy as bears and other mammals feast on the bounty. We may hear, and, if we’re lucky, see the elusive coastal wolf, which researchers recently confirmed catches salmon, too. Eagles by the hundreds, ravens, harlequin ducks and a host of other birds join the fray. To witness these phenomena are two of the greatest experiences in nature. 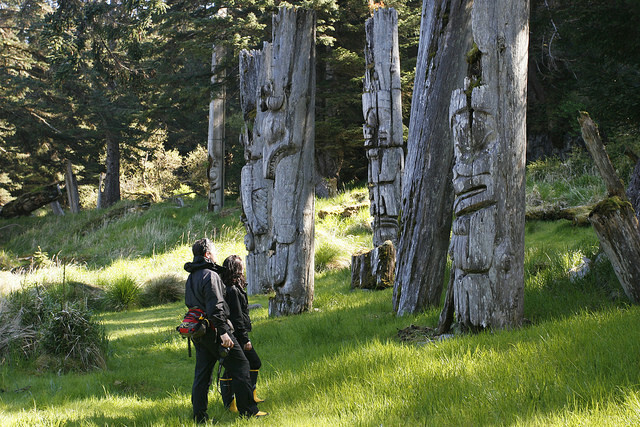 Explore the worlds of several northwest First Nations: the Heiltsuk, Kitasoo Xai’xais, Haisla, Gitga’at and Henaaksiala. Everywhere is evidence of their civilization. Fish traps, bark-stripped trees and longhouse remains give testimony to a way of life tuned to the rhythm of nature. You’ll visit modern villages, talk with local residents, and see the ancient art traditions still in place today. The Great Bear Rainforest’s ocean frequently provides succulent Dungeness crab and prawns for our table. We often visit one of the natural, out-of-the-way hot springs that bubble up here. Anchoring in a cove or bay, you’ll go ashore by zodiac or kayak and sink into the rejuvenating warm water. A far cry from commercial hot springs, these pools are usually empty but for ourselves. A ten-year land use plan recently announced by the B.C. government, with stakeholders from conservation groups, First Nations, tourism, local communities, resource extraction industries, scientists and others, protects 2 million hectares of this wilderness. Sadly, much of the rest of the area is immediately threatened by massive clear-cut logging. We feel it is critical that as many people as possible see this place and become aware of the magnitude of the potential loss of so much critical habitat and immeasurable beauty. We have selected our favourite season in the Great Bear Rainforest – where the fall salmon run brings grizzly, spirit and black bears to the coast, as well as sea lions, killer whales, seals, eagles and wolves. In the springtime, the meadows burst with new plant life, and newly-awakened grizzly bears graze on tender new shoots. This is also a beautiful time to visit and there are 7 day/6 night trips available in May. Please ask us for those details if you are interested in spring departures. SV Maple Leaf Accommodation: The spacious main cabin on this 92-foot sailing schooner is airy and divided by half-walls and heavy curtains into four “cabins,” providing sleeping accommodations for eight guests. Each area contains large comfortable beds (six and a half feet long), space for your belongings, brass reading lamps, fluffy duvets and blankets. They have walls on two-and-a-half sides and thick, heavy curtains on the other one-and-a-half sides. There are three heads (washrooms) aboard, all with hot running water and shower conversions. MV Swell Cabins: There are 3 cabin categories on this 88-foot converted tug boat. Cascadia (Catamaran): Cascadia is a go-anywhere, expedition style catamaran. She accommodates up to 24 guests in 12 luxurious cabins, with a crew of 10. 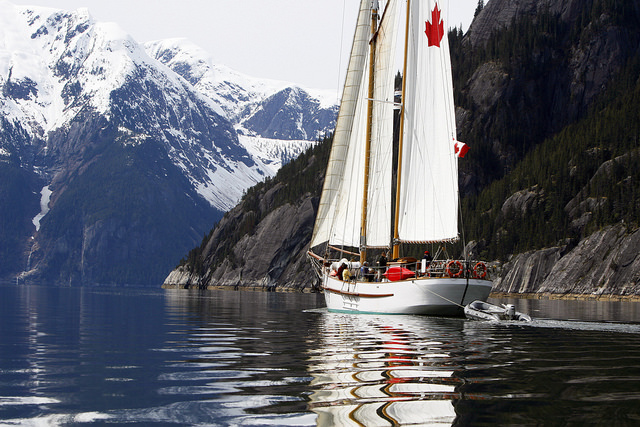 She is unlike any other vessel offering expeditions on the BC coast, having been built specifically for high-quality, boutique cruises. 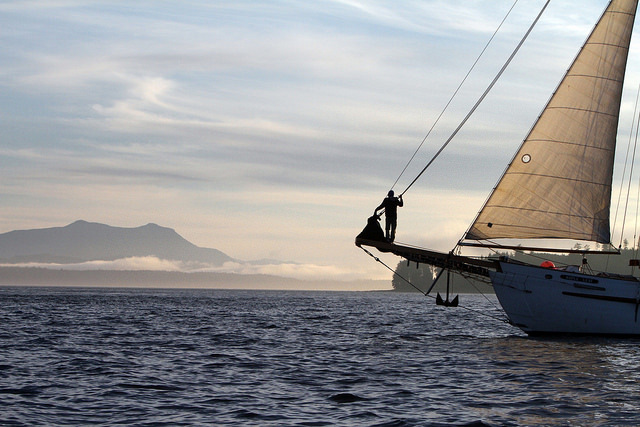 Light, spacious and comfortable, she is also capable of reaching the wildest, most naturally rich places on the coast. Her small size and guest numbers provide an authentic, human-scale experience that respects the carrying capacity of coastal inlets and communities. The Cascadia offers three cabin categories.